I have posted a draft of my latest article, Free Speech in the Algorithmic Society, on SSRN. 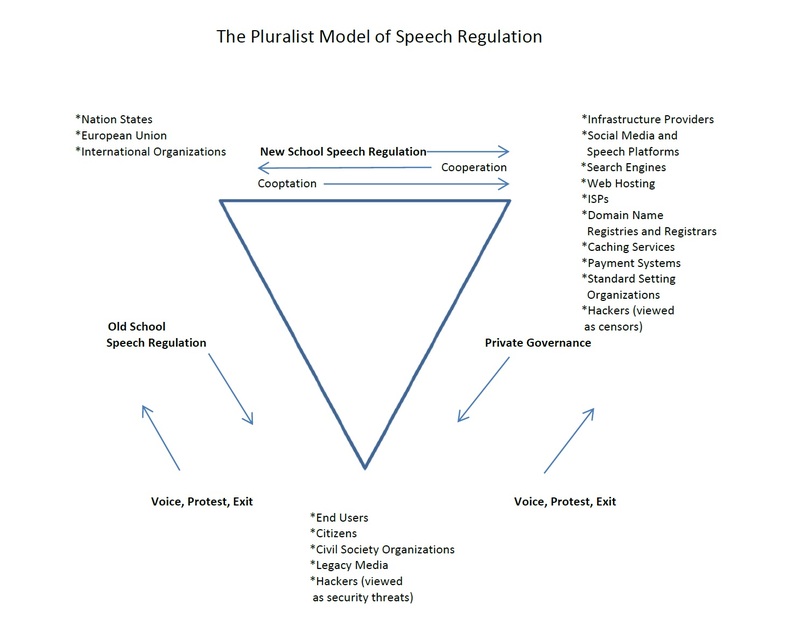 It introduces the idea of a pluralist model of speech regulation that contrasts with the traditional dyadic model -- in which nation states regulate the speech of private citizens. The Algorithmic Society presents two central problems for freedom of expression. First, Big Data allows new forms of manipulation and control, which private companies will attempt to legitimate and insulate from regulation by invoking free speech principles. Here First Amendment arguments will likely be employed to forestall digital privacy guarantees and prevent consumer protection regulation. Second, privately owned digital infrastructure companies and online platforms govern speech much as nation states once did. Here the First Amendment, as normally construed, is simply inadequate to protect the practical ability to speak. The first part of the essay describes how to regulate online businesses that employ Big Data and algorithmic decision making consistent with free speech principles. Some of these businesses are information fiduciaries toward their end-users; they must exercise duties of good faith and non-manipulation. Other businesses who are not information fiduciaries have a duty not to engage in algorithmic nuisance: they may not externalize the costs of their analysis and use of Big Data onto innocent third parties. 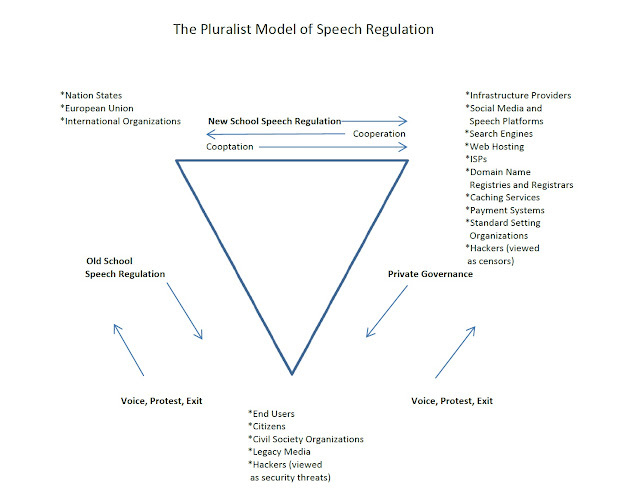 In the pluralist model, territorial governments continue to regulate the speech directly. But they also attempt to coerce or co-opt owners of digital infrastructure to regulate the speech of others. This is "new school" speech regulation. Digital infrastructure owners, and especially social media companies, now act as private governors of speech communities, creating and enforcing various rules and norms of the communities they govern. Finally, end users, civil society organizations, hackers, and other private actors repeatedly put pressure on digital infrastructure companies to regulate speech in certain ways and not to regulate it in others. This triangular tug of war -- rather than the traditional dyadic model of states regulating the speech of private parties -- characterizes the practical ability to speak in the algorithmic society. The more that end-users view businesses as governors, or as special-purpose sovereigns, the more end-users will expect -- and demand -- that these companies should conform to the basic obligations of governors towards those they govern. These obligations include procedural fairness in handling complaints and applying sanctions, notice, transparency, reasoned explanations, consistency, and conformity to rule of law values -- the “law” in this case being the publicly stated norms and policies of the company. Digital infrastructure companies, in turn, will find that they must take on new social obligations to meet these growing threats and expectations from nation states and end-users alike.